When I moved into the Project SERVE House, on August 27th 2010, I was greeted by my community members and program director and we launched into an exciting week of orientation- filled with activities to get to know each other, discussion of the pillars and visits to our placement sites. 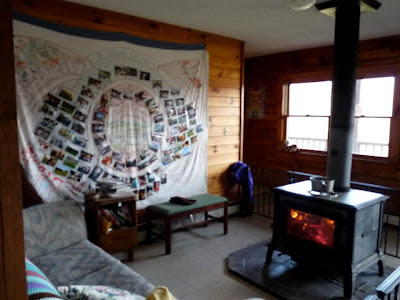 All the while, noticing a very naked looking wall in our living room where we gathered. Then, after that busy week, but before we started work, we had… a long weekend. What would we do with ourselves? It was thanks to Bethany’s suggestion and Rebecca and Faith’s artistic eyes that we ventured to the local art supply store to set out upon creating our mural. Rebecca sketched our creation (based on the tree of life) and the rest of us followed with paint brushes in a “paint by numbers type fashion”. The mural became the pride and joy of our community, the focal point of every house tour we gave. 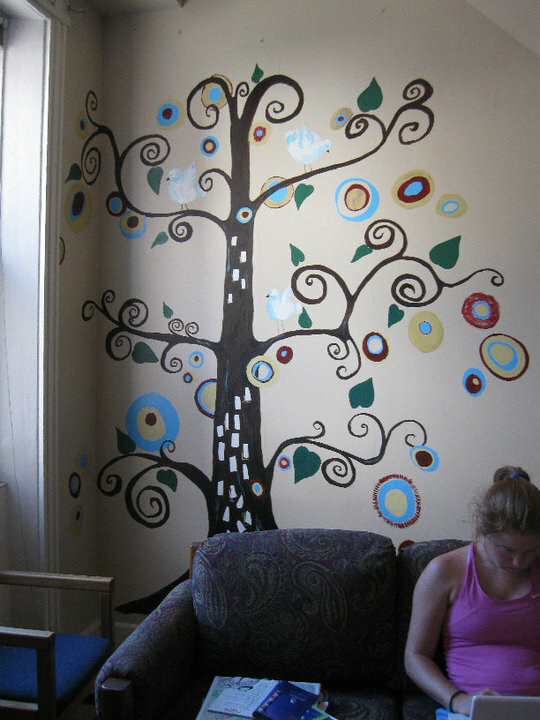 Recently, it got me thinking… what have other volunteer programs done to beautify their homes and living communities? I asked and you responded. 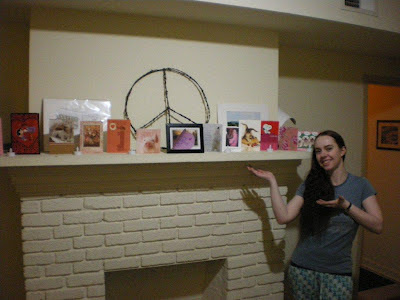 Liz (pictured above) and Lisa-Rose from So Others Might Eat (SOME) created a “showcase” of cards and photos that were sent to them by family and friends. Liz says, “bringing in aspects of our lives from our past or from afar allows us to have a better and deeper understanding of one another while beautifying our space at the same time”. 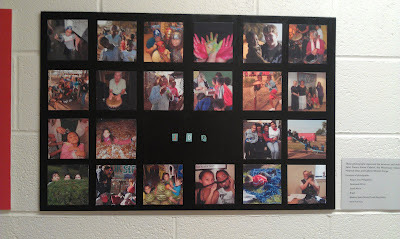 Colleen from Cabrini Mission Corps gathered photos of Cabrini missions from all over the world and then assembled photo boards in the themes of hope, faith, love and joy. She says that she got this and many other artistic ideas off of Pinterest. Finally, this one comes from our Recruiter, Matt Aujero, and his FrancisCorps community in Costa Rica. To commemorate the retirement of their founder, program director, mentor and friend, the volunteers planted a mango tree in their yard. May these projects inspire you to share the beauty of God’s love in your homes and the lives of those that you serve! If you’d like to share your CVN Creation, please send a picture and a brief description to [email protected].